LUKE McGEE was earmarked to resume training this week. And Kenny Jackett believes the keeper has the ability to regain his spot in Pompey’s starting line-up. McGee has been unavailable for the Blues’ past eight matches after picking up a wrist injury. Meanwhile, the Tottenham academy graduate has failed to make a single League One appearance this season, instead restricted to Checkatrade Trophy and Carabao Cup outings. 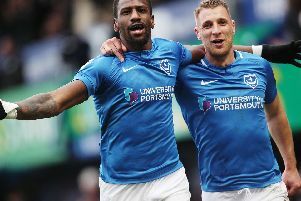 After featuring 50 times last term, summer signing Craig MacGillivray dislodged McGee between the posts and has been ever-present during Pompey’s title charge. Jackett still holds the 23-year-old in high regard, but admitted his decision-making and distribution must improve. If he can do that, the Blues boss feels McGee is capable of winning back his berth. ‘Luke has been good and I’ve had no problem with his approach at all,’ said Jackett. ‘For him, he’s played two full seasons and that’s football and how it goes. ‘He had a full year at Peterborough two seasons ago and a full campaign last year when we finished eighth in League One. ‘This season, he’s been behind Craig. ‘That will be frustrating for him but he has to realise we all rate Luke and know he has ability. He has a lot of ability, Luke McGee, and he can fight back. ‘He is an outstanding shot-stopper, like a lot of goalkeepers. At times, he can be more commanding when coming for crosses. ‘His kicking is good but he needs to be more consistent with his distribution. ‘That is a summing up. But that would be indicative of a lot of young goalkeepers and he’s capable and big enough to command his box in terms of crosses. McGee moved to Pompey for an undisclosed fee in July 2017, penning a three-year deal. After being Jackett’s No1 last term, he’s had to play a support-act role to MacGillivray this season. Yet the Blues manager feels the ex-Peterborough loanee can vie for the Scot’s place when he regains full match fitness. Jackett added: ‘You do need to play. You can practice, but need to see where you are. ‘He’s played two full seasons while Craig had only made 26 appearances when he arrived.